Content Marketing: definition, benefits, techniques. Nowadays, the strategy your business uses to find its target public is completely different from a few decades ago. Content Marketing has become one of the digital era’s most effective techniques in terms of finding potential clients and retaining the ones that have already bought something. 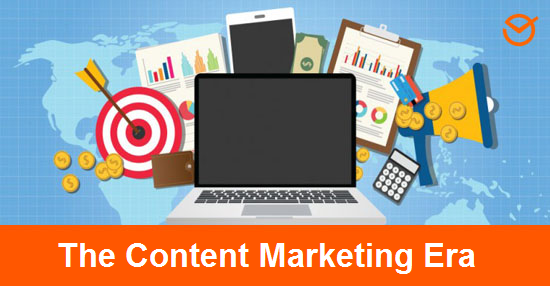 Content Marketing is not only used to attract interested people towards your brand’s proposals, but it is also the best way to transmit your business’s identity and values while enabling you to secure a spot in these people’s daily lives through the use of Social Networks. What is Content Marketing and what’s it good for? 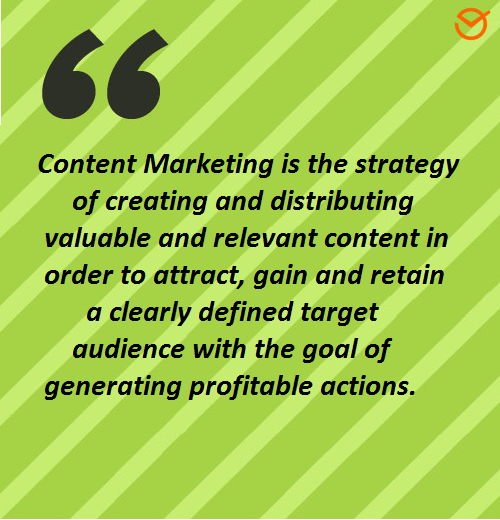 According to San Diego University, “Content Marketing refers to the process of creating and distributing relevant and valuable content to attract, acquire and build customer loyalty among a clearly defined audience with the goal of generating profitable actions among consumers”. Furthermore, specialists point out that in order to attain said objectives, its fundamental to work with well-developed and quality content. Meanwhile and due to Content Marketing’s cultural contribution, the Harvard Business Review has indicated that we are in “The Age of Corporate Enlightenment”. Experts explain that through such medium: “Nine out of ten companies work with Content Marketing -which is, they go beyond traditional sales techniques and instead they promote brands through the publication or diffusion of information, ideas and entertainment that is valued by the consumer”. They also indicate that “Successful Content Marketing has radicalized the way in which companies communicate. For innovative brands, a “winning” Tumblr carries a significant impact; hashtag campaigns have become just as compelling as slogans (…)”. Thus the Harvard Business Review has arrived at the following conclusion: “The Content Marketing revolution (…) marks an important new chapter in commercial communications history: the corporate enlightenment era”. It’s the best way to reach your target audience by offering relevant and quality content to them. It enables you to transmit your brand’s values. It helps you attract and retain potential clients on Social Networks. Creating articles and content that are relevant to your audience makes it possible for you to utilize SEO techniques , which help to favor your appearance in the first few results on Google searches. According to Forbes magazine, 88% of B2B Businesses (meaning, businesses focused on selling to other businesses) use Content Marketing as part of their marketing strategy. 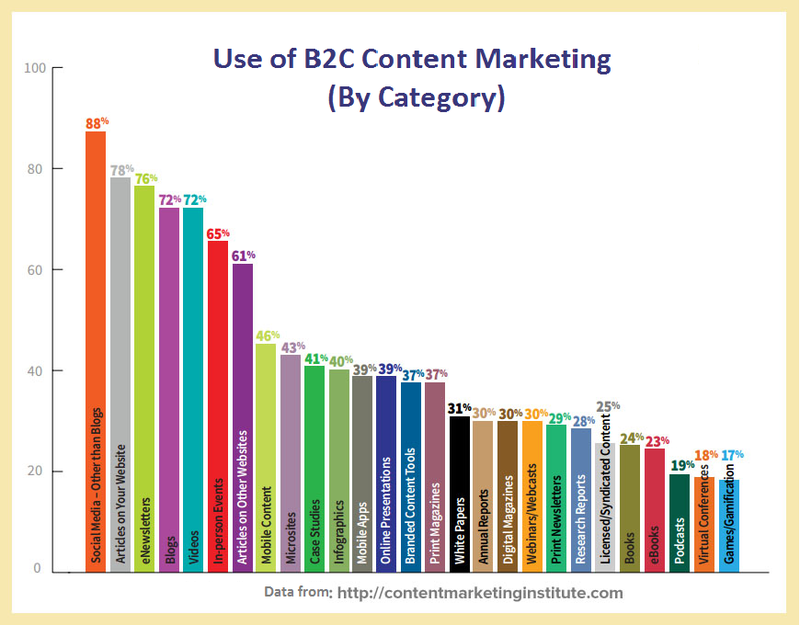 The most successful B2B Content Marketing specialists designate a large proportion of their resources to said strategy: 42% of the total budget compared to the 28% designated for less effective measures. 90% of B2C Businesses (meaning, businesses focused on selling to the final consumer) utilize Content Marketing to build and promote their brand image. 48% of the most effective B2B marketers have a documented editorial plan as part of their content strategy . 61% of the most successful content marketing specialists meet daily, or monthly, with their work team. 76% of B2B marketers decided to produce more content in 2016. 94% of B2B marketing specialists keep their LinkedIn current as part of their content strategy. Other popular platforms are Twitter (87%), Facebook (84%), YouTube (74%) y Google+ (62%). 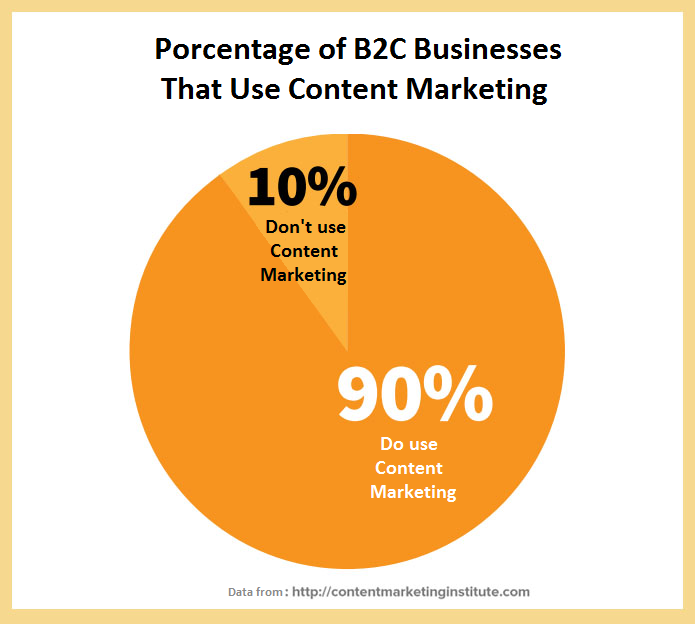 85% of the most effective B2C Businesses have someone who coordinates their content marketing strategy. 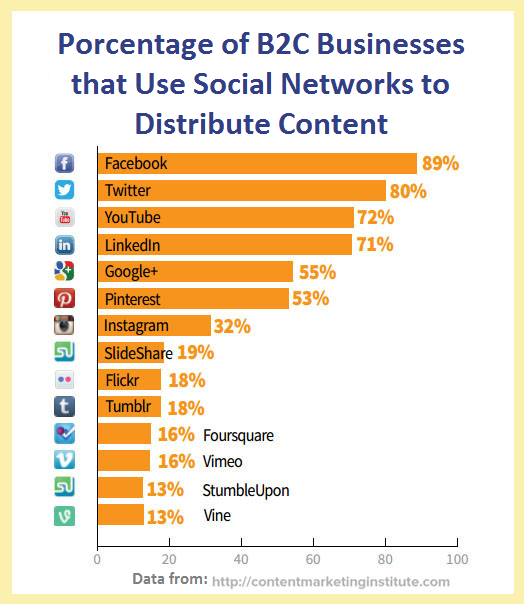 Both B2B Marketers and B2C Marketers use an average of six Social Networks. As you may have noticed while reviewing the previous statistics, more and more businesses are understanding the importance of this strategy as a means of reaching their audience on the Internet. It’s for this exact reason that Content Marketing is becoming an irreplaceable tool for brand positioning. One of the best strategies for getting the max out of Content Marketing is to create your own articles for your blog or website, and then promoting them on Social Networks. Why? Because this enables you to increase web traffic to your site and to offer original and relevant content to your audience. Email Marketing, which is mailing newsletters and promotions to your audience via e-mail, is an excellent form of keeping your public informed on your content and news as well as spreading your commercial proposals. Making the creation of videos an integral part of any content marketing strategy is very favorable since this class of content happens to be one of the most shared on Social Networks. Therefore, its recommended to create a YouTube channel (currently the most important video platform) and share your videos from there. Social Networks are where you’ll be able to find and interact with your audience, which makes it the medium of choice for diffusing your content. Thus, you should remember to optimize your blog or website so that people can share your articles on Social Media. Furthermore, being that it’s not feasible to generate your own content every day and publish it on Social Networks, it’s important to find qualified sources where you can get relevant articles to share on your channels. 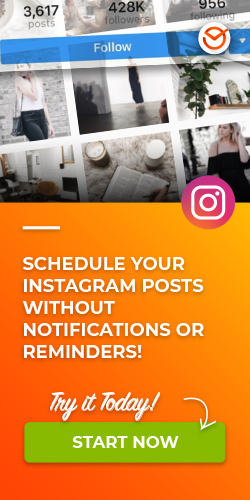 To always keep your accounts up to date it advisable to use a tool, such as, in order to schedule your publications for the week or month and have them be automatically shared on Social Networks. 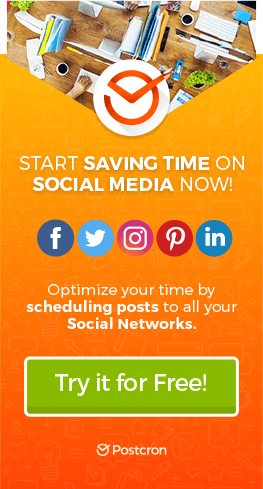 This way you save working time and no longer need to be online all day. And finally, social platforms should be seen as a mere means of diffusion, but rather for interaction. It’s with communication that long-lived relationships are built and that’s why you can’t forget to interact with your audience with things like comments, responding to messages and giving a “Like” whenever you can. Another pillar of Content Marketing is the production and diffusion of graphic pieces on both blogs and Social Networks. Said content is said quite often on Social Media thanks to its visual attractiveness and they include the creation of infographics and animated GIFS, photographs, illustrations and images with text. Certainly there are many other types of content you can share to go along with your marketing strategy since its basically about sharing relevant information (meaning, information which entertains, teaches, informs and moves your public). So, for example, you can create Podcasts (audio pieces) to share, you can take part in organizing Webinars (online seminars about your products, services or themes relevant to your sector), you can develop mobile applications, you can publish e-books and even develop themed games. Well, that’s all for today! As you can see, Content Marketing possibilities are many which makes this technique one of the most flexible and adaptable for your business. Therefore, I advise going over which of them will be best for you and then taking advantage of them immediately. Did you like this blog post? Which Content Marketing techniques did you find most useful? Why? Tell us your opinion! And please, don’t forget to share this article with all your contacts. See you in the next article!